In North Wales culture is extremely strong and the Welsh language remains vibrant in many parts. However, in strong areas of tourism like Conwy then everything changes. Despite this, the power of Welsh history remains powerful within the landscape. I enjoyed painting this scene because images of North Wales are a treat to behold. 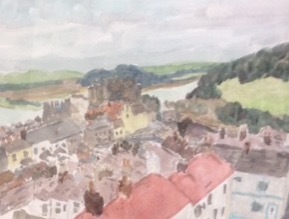 In my world this art piece comes alive because of the passion I felt in Conwy.